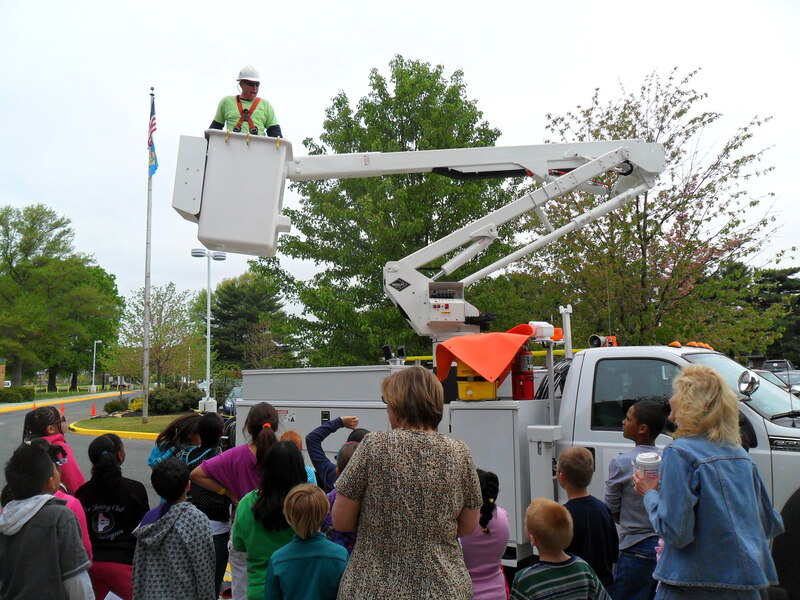 DOVER, Del.- Delaware Electric Cooperative Lineman Richard Moore wowed students last Friday at East Dover Elementary School’s super science day. Moore spoke to hundreds of students throughout the day about electrical safety and his job as a lineman. Moore, a 43-year veteran of the Co-op, urged students to tell their parents if they come across downed power lines. Students also got a special look at the equipment Moore uses every day to keep him safe while working on or near power lines. “This is an important message to send to students,” he said. Students at East Dover Elementary School were most impressed by Moore’s demonstration of his truck’s boom, which he raised into the air for each group of students he spoke with. Moore answered student’s questions and even took the school’s principal for a ride in the bucket. Delaware Electric Cooperative was proud to join engineers, meteorologists and other professionals from across Delmarva to take part in the special event.